We often hear about knee or hip replacment surgeries. But did you know that there are also ankle replacement procedures? 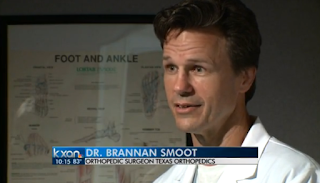 Dr. Brannan Smoot, Orthopedic Surgeon at Texas Orthopedics, says that while ankle replacement surgery is still an uncommon procedure, because of recent refinements, we will likely see more of these types of surgeries in the future. Watch Dr. Smoot's interview with KXAN-TV to learn more about this procedure.